The little boat with a big past: the fight to save one of the most important artefacts of Australian military history. For many years, thousands of people have walked past an unassuming black timber fishing boat bobbing in the water down at the wharves of Sydney's Darling Harbour. But appearances can be deceptive. This humble little trawler played a key role in one of World War II's most audacious and successful commando raids. In September 1943, fourteen young Z special operatives sailed the small fishing boat from Australia to Japanese-occupied Singapore. Battling deadly tides, fierce storms, hostile ships and detection from the air, this little ship and its courageous young crew made it to the heart of the enemy stronghold to make a daring raid that destroyed 30,000 tonnes of enemy shipping. Operation Jaywick still rates as one of the greatest Special Forces operations of all time. But its story doesn't end there. Neglected and left to rot for years, it has taken a mighty and concerted effort by a dedicated few to save and restore the little ship with a big past and display it as a permanent memorial to Australian Special Forces. 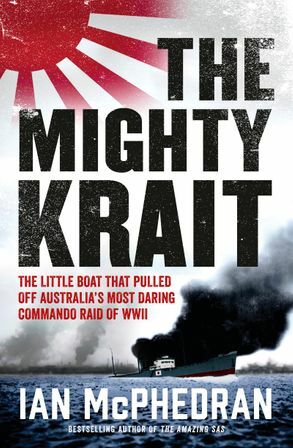 The Mighty Krait is a compelling, uplifting and unforgettable story of Australian military history - and the importance of reminding all Australians of the courage and service of our armed forces. Ian McPhedran is the award winning bestselling author of five books. Until 2016, he was the national defence writer for News Corp Australia and during his extensive career as a journalist he covered conflicts in Burma, Somalia, Cambodia, Papua New Guinea, Indonesia, East Timor, Afghanistan and Iraq. In 1993, he won a United Nations Association peace media award and in 1999 the Walkley award for best news report for his expose of the navy's Collins class submarine fiasco. McPhedran is the author of several bestselling books including The Amazing SAS and Too Bold to Die. He lives in Balmain with his journalist wife Verona Burgess.